Western States 100 Crew Report: A Song of Ice and Mud – Running + Crying, Mostly. I always cry at the finish line of a race. Every single person who finds themselves at the finish line does so as the culmination of some personal story of determination, resistance, and commitment. I can’t keep it together when I see the relief on their faces as they complete the race, flying or hobbling across the finish line, experiencing their own greatness in such a raw and undeniable way. …But we won’t get to the finish line for a little while yet; the story of my weekend crewing Matt at WSER starts early on a Friday morning as we departed Sacramento for Squaw Valley, winding up the familiar mountain roads of Highway 80 to the unfamiliar terrain that is this hallowed race. If you’re unfamiliar with Western States (then go familiarize yourself because the history is amazing), you should know that there’s a whole process for entering: You have to run a qualifying race, after which point you can put your name into a lottery. Your entries into the lottery are based on the number of years you’ve applied to the race, starting at 1 for your first year and doubling every year afterwards. Matt has been running ultras since 2014, and entering his name (boldly, I might add) since 2015. With our wedding and several other big life moments happening this year between the two of us, we had joked that this would be a seriously inconvenient year for such an undertaking. So naturally, here we are. We left home base early on the Friday before race morning for Squaw Valley, and arrived by 9am as planned. Matt took the opportunity to walk around and “acclimatize” (Western States starts at about 6000 feet of elevation, whereas Matt lives and trains at sea level) (also, like, all the cool brands were there! gotta get stickers AMIRITE?!). I holed up in the hotel lobby, getting work done and thinking too little about the weekend ahead. I took a break to join Matt at the pre-race briefing, where we were enlightened with such gems as “everybody’s gonna get a little bit of rhabdo” and other things you don’t hear outside of extreme sports. We ate dinner early with my parents and Matt’s dad in Squaw and tucked in early, Matt satisfied with his level of pre-race prep and understanding that the sleep he could find tonight would have to carry him through a full night of running in the Sierra Nevadas. Race morning jaws at us, as it always does, with a combination of urgency, excitement, and just a sprinkle of dread. WAKE UP! I glance at the glaring red numbers on the hotel clock: 4:08am. Matt has been up for over an hour, unable to fall into deep sleep the night before, the enormity of the task before him obstructing the body’s attempt at total rest. Matt doesn’t convey his anxiety outwardly as we leave the warmth of the hotel room and walk briskly into the crowd surrounding the starting line. One of the hallmarks of ultrarunning, or so I’ve observed, is the adoption of a cavalier attitude about the difficulty and outrageous nature of these types of races. The races get harder and harder, but our resolve appears to steel as we confront more remarkable challenges. There’s always someone tougher than you on the course- best not to overstate your struggle in search of some type of recognition. After all, everyone toeing the starting line here at 4:58am on this off-puttingly warm morning in Tahoe has paid for the pleasure of the impending pain. The race was bound to be a hot one, with temperatures predicted to be in the low 100s for much of the daytime. With snow still blanketing the escarpment (the first and highest section of the race), the mixture of elements would be an interesting footnote to an already challenging race. I mean, I guess people don’t run mountainous ultramarathons because they’re easy, but nature was certainly cutting these runners no breaks. The starting gun was fired (was there a starting gun? Maybe I’m lying, I was really sleepy) and the runners were off, immediately beginning a steep climb out of the gate. The mood is festive: cowbells, hoots, hollers. I had climbed up about 100 feet past the start to get a better view, and I watched as the sun broke into the sky from the east. Watching runners start a race that will likely go more than 24 hours is pretty anti-climatic… like, okay, they’re off, I guess I’ll just start my weekend of waiting. I had this pipe dream of going back to the hotel room and getting more sleep but… alas, I am not immune to that race day adrenaline. I decided to totally embrace the chaos, grab an iced coffee at The Village, and then head back down the hill where crew duties awaited me at Robinson Flat aid station (Mile 30). Now, I have crewed Matt for approximately, what, 10 ultras? and our strategy has always been to wing it. I’ve grown to understand that most racers put a good deal of prep into the logistical elements of racing- where their pacers should meet them on the course, what types of supplies they should have available, how transportation is occurring, if a pacer if necessary… sometimes this culminates in a pre-race briefing, where your crew of MORE THAN ONE PERSON figures out the optimal way to support you over the course of a 24+ hour test of human endurance. This has never been the case for us. We fly by the seat of our running shorts when it comes to operational race day prep. I game everything out alone and hope I end up supporting Matt adequately day-of. I am crew captain, crew, and occasionally pacer (I have abandoned umbrellas, cars, and other disposable accessories at aid stations when, mid-race, I am called to join Matt on the course for an impromptu 13-mile pacer duty). In my mind, this has always been fun – part of the adventure! But today, as I haul a cooler full of ice up a hill and into a aid station shuttle vehicle née school bus, I’m thinking I could have used a better plan. I set up camp at Robinson Aid station (mile 30-ish), parked near a resilient pack of snow under a tree as the temperatures ticked up towards 100. I wasn’t expecting Matt for at least an hour at this point, but meeting your runner at aid stations is an exercise in patience, not precision. I’ve long since resigned myself to the practice of making new friends in these scenarios, yoking myself to strangers in the shared experience of being adjacent to and instrumental in someone’s huge dream. Minutes became hours as they passed, marked by the steady shuffle of runners through the aid station. I caught bits and pieces of reports of conditions on the course- the first 10 miles had been icy snow, slippery and treacherous, with snow bridges crumbling under runners’ shoes and resulting in a few twisted ankles. The snow yielded to mud as the course worked downward, which provided its own set of challenges (many a shoe was slurped into the muddy maw). Then came the heat. There was no relief from the elements, as if some conspiratorial god was rolling a particularly cruel die. Matt came into the aid station looking grim. The 30 miles had taken their toll, and he looked about as bad as I’ve seen him look at 80 miles on more pleasant days. 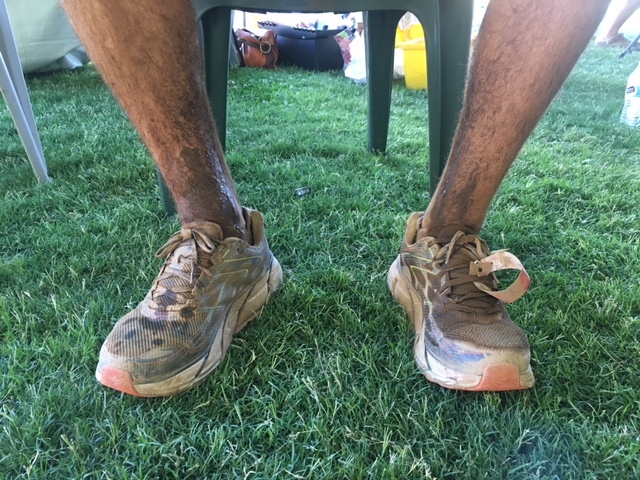 I tried to hide my surprise at his battered state and just go through the aid station checklist: socks, shoes, feet, hydration, electrolytes, calories, emotional state. Matt explained in detail what I’d been hearing in pieces: the course was exceptionally spicy due to the trio of snow, mud, and heat. After chugging some pedialyte and changing socks, Matt headed back out into the heat of the day. The next stop where I’d have a chance to see him would be Foresthill (mile 62). After driving back to Sacramento, taking a dip in my parents’ pool and eating an early dinner, I made my way back up to the course & arrive to Foresthill around 9pm. I set up camp out of the back of my parents’ SUV, checking inventory as I unpacked: chairs, Matt’s backpack, the ice chest, Matt’s spare shoes, blankets, etc etc. I love late night aid stations. The volunteers always make it so festive, and the result is this hilarious juxtaposition of chipper aid workers in tutus and flashing neon lights, and the muddy, beat down runners shuffling in, looking slightly disoriented and weakly smiling weakly as they arrive, modeling various stages of breakdown. I also love the feeling of having to just hunker down for the night. Like, it’s 10pm and I’m drinking coffee from a thermos and sitting in a stadium chair like a soccer mom, cheering for people I don’t know and constantly recalculating my prediction for when Matt will arrive. I’m in DEEP. Matt’s dad joined me for some time at this aid station, and it was nice to have company. We were both a little worried about Matt (I ALWAYS worry), but eventually he arrives at Foresthill, looking slightly better than he did at mile 30 but flirting with the cutoff time (on pace for just under a 30 hour finish) (he’ll get mad at me for saying that, but the margin for error gets smaller as the race progresses, so being close to the cutoff gets scary). I get him fresh socks and shoes, a portable charger to reinvigorate his GPS watch, and some electrolytes. At this point, he’s eating soup and pickles (pickles have become a new fave in our family) and feeling ready to head out into the night. His dad and I walk him down about a quarter of a mile and send him on his way. Now, we’re closing in on midnight, and I have to make a decision about where I’m going to sleep. I’ve been driving all day, so I ultimately opt for a car nap, thinking it would be better to sleep for an hour or so before heading back into the night. I had planned to meet Matt at Mile 79.8 (Green Gate Aid Station), but he wasn’t due in until 4:55am if he stayed at his current pace, so I had time to kill. I headed to Placer High, which is the finish line. It was around midnight by the time I arrived, but rather than go to sleep immediately, I followed the glow of the stadium lights to the track and inserted myself into the action, watching runners cross the finish line. I headed back to my car to take a nap, and got an hour of sleep in before waking up around 2:30am. I shuffled around my car until taking off just before 3am, groggily navigating the pitch-black, winding mountain roads from Auburn towards Cool, CA. This was a really scary drive. Trying to navigate and drive in total darkness and with limited sleep proved challenging, and I ended up pulling over a couple of times, reorienting myself and sipping from a thermos of lukewarm coffee. After 30 minutes of white knuckles and fear, I parked my car on a dirt road and started the 1.5 mile trek down towards the river crossing. It was still dark, and silent apart from the crunch of dirt underneath my shoes. I passed a few people heading back up from the aid station, franticly asking them “how far down to the aid station?”. It was 3:30am — nearly an hour and a half before Matt was scheduled to come through — but I had a bad feeling in my gut. I started running, and made the hike in about 12 minutes. I arrived at the aid station, breathless. “Has 293 come through?” I asked? No way he could have picked up 1.5 hours in the middle of the night, I rationalized. My heart dropped. I’d missed my runner. How was that possible? But also… DAMN, somebody had picked up the pace. My feelings were conflicting: there was disappointment and shame at the inadequacy of my planning, but also immense pride. He was getting stronger. A smile crept across my face as I turned around and started my 1.5 mile hike back up to my car. It was still dark on the trail — it was a new moon that night — and I was all alone. I remember stopping on the dirt trail and just listening. The aid station was down by the river, and the morning air was cool. I could hear the water rushing in the distance, with the occasional eruption of hooting from the aid station bouncing off of the water. I’m not sure how often you find yourself on a mountain trail just shy of 4am, but it was kind of liberating. I had a few hours until the next crew accessible station (Pointed Rocks, mile 94.3), but I didn’t want to make any more critical crew/pacer mistakes, so I headed straight there. My blood was pumping after the hike back up to my car, so I took the winding road straight to the aid station and parked. I munched on an early breakfast of stroopwafels and sipped now-cold coffee, and decided to head to the aid station (about a mile away) to check out the scene. It was now past 5am, and the sky had lightened in the distance. I made my way to the actual aid station, realizing quickly that I had nowhere to sit and nothing to eat… and no way of knowing how long this was going to take. I turned around and ran back to my car, grabbed a towel and a bottle of pedialyte, and then returned to the aid station. I looked at my phone when I’d settled back at the aid station: I’d already walked 6 miles that day, and there was still plenty of day left to conquer. So, the reason I grabbed only a towel to sit on and a plastic bottle of pedialyte for sustenance is because, planning ahead for when Matt arrived at the aid station, I would have no way to transport my things back to my car should I need to run with Matt from Pointed Rocks to the finish line. So, I brought things that I’d be okay with ditching. However, I realized that was unnecessary after spotting some new friends I’d made back at Robinson Aid Station (that was 60 miles ago, remember?). They offered to haul my things back to the finish line if I had to run off in a panic with Matt – see kids, friendship is convenient! But no, seriously, these women saved me from having to sacrifice yet more items to the race gods. Plus, it was nice to wait out the early morning hours with other people, chatting happily rather than waiting silently. Matt comes into the aid station at 7:40am. He’s officially been racing for 26hrs and 40mins, which probably contributed to his lack of interest in stopping with only 6 miles to go. I pin my pacer number on myself and hop on the trail with him, less pacing at this point than just providing him with some company for the final push. As far as finishing a race goes, this one was relatively undramatic. No lost keys, nothing suspenseful. Just continuous forward progress, peppered with sporadic conversation. Western States has this kind of awful climb out of the valley at the end, where you KNOW you’re getting close to the storied Placer High track finish line, but you can’t see anything that resembles civilization. That was definitely where impatience started to seed itself. I remember Matt grumbling “where’s the damn school? !” more than once. Long story short (ha! not really): he powers through the final stretch, blowing past the last aid station and winding through the neighborhood that leads to Placer High. 28 hours have led to this moment. He takes off around the track and I cut through so I can watch him cross the finish line. 28:03. I’m not sure how to wrap this up. I guess I’ll end it like I started: at the finish line, me fighting tears and feeling the weight of the day.